The appropriated text in this work might be a caption beneath a New Yorker cartoon, a tagline in an advertisement for a luxury item, or a quotation from some great work of literature. Steinbach's gesture of removing words from one context and placing them in another demonstrates their fluidity while allowing us to think about language not just as a means of communication but as aesthetic and symbolic images (letterforms) or objects (words, phrases, sentences). 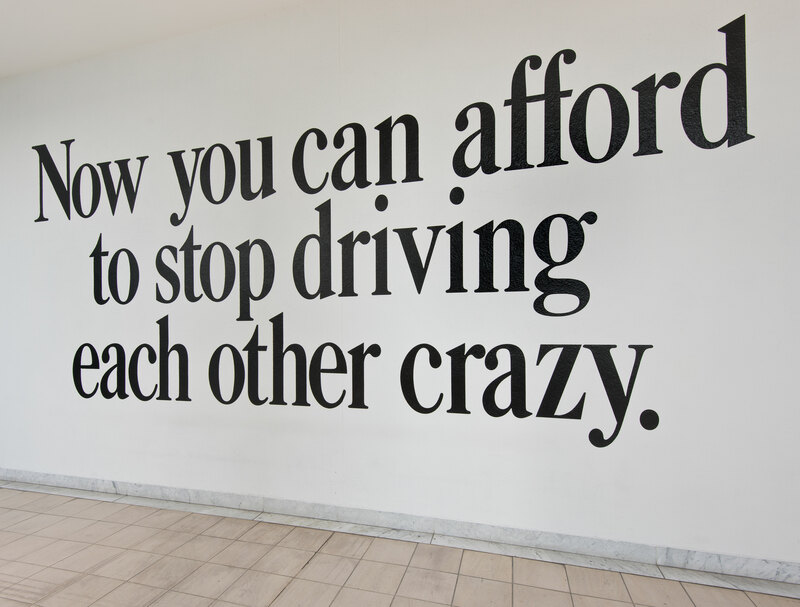 "now you can afford to stop driving each other crazy." Take It or Leave It: Institution, Image, Ideology Digital Archive. Los Angeles: Hammer Museum, 2017. https://​hammer.ucla.edu/​take-it-or-leave-it/​art/​now-you-can-afford-to-stop-driving-each-other-crazy/​.